Seedbeads have always been around just like the other beads. There are different types out there and vary from sizes to quality. These beads have always fascinated me because of the finishing and beauty they exude when used alone or combine with other bigger beads. Just to chip in, they come in sizes 6/0- 15/0. The higher the number on it, the smaller the size. For instance, the size 6/0 is bigger than size 8/0 and that is also bigger than size11/0. This goes on if you understand what I mean. They come from different manufacturers, hence this shows in the quality, colour and uniformity of the seed beads. The cheap ones are not uniform in their cut,some of them fade fast, while others tend to loose their lustre and shine as time progresses. The expensive ones are uniform in size and cut. They retain their shine and look more polished. Either way, seedbeads are lovely when you work with them. Here, a potpouri of two colours are used to create this multi-strand set. They are 31 strands interwined in this necklace while a matching earring is picked to go with the brooch. By the way, the brooch is optional as you can equally rock the necklace without one. 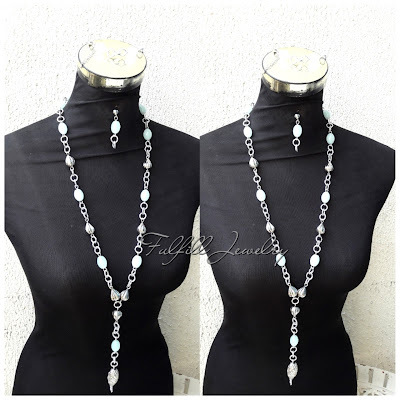 Also, a multi-strand drop earrings and bracelet can be made to go with the necklace. There are variations to this design. Meanwhile, here is what I did..